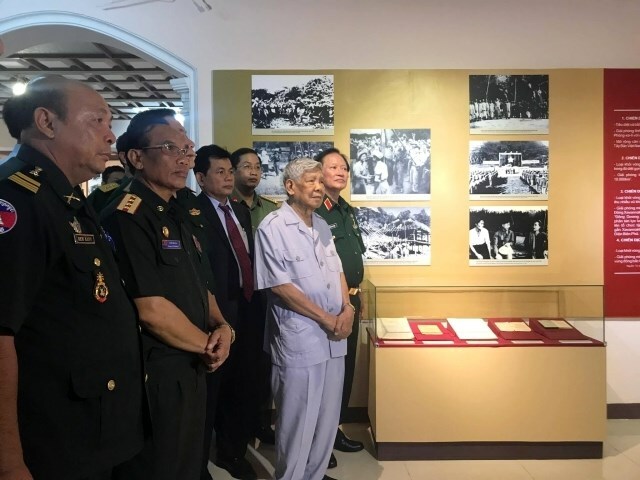 Hanoi (VNA) – An exhibition spotlighting the friendship among Vietnam, Laos and Cambodia opened at the Vietnam Military History Museum (VMHM) in Hanoi on August 30. The event is held to mark 40 years since Vietnam and Laos signed a Treaty of Amity and Cooperation (July 18, 1977-2017), the 55th anniversary of Vietnam-Laos diplomatic ties (September 5, 1962-2017), and the 50th anniversary of Vietnam-Cambodia diplomatic ties (June 24, 1967-2017). Speaking at the opening ceremony, VMHM Director Nguyen Xuan Nang said that the Vietnam-Laos-Cambodia special relationship is an example for the pure and faithful attachment between the three nations in their struggles for national liberation and social progress. The exhibition showcases over 300 photos, documents and objects divided into three parts. The first part includes photos, documents and objects highlighting the solidarity of the three Indochinese nations during the anti-French resistance war from 1945 to 1954. Meanwhile, their solidarity in the anti-US resistance war during 1954-1975 is highlighted in the second part which contains photos and objects related to the Truong Son strategic transportation route – a symbol of the Vietnam-Laos-Cambodia relations.